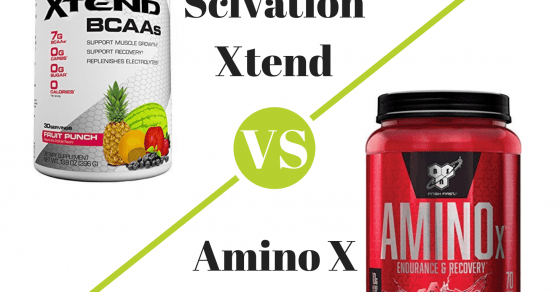 Last Updated on March 3, 2019 by Radica VuckovaWhen you’re looking for BCAAs and the choice comes down to Scivation Xtend vs Amino X, which one should you choose? Let’s look at flavor options, sizes, and ingredients to see which one is the best BCAA powder for your needs. Topic Contents1 All About Scivation Xtend1.1 The Flavors1.2 It comes in a few sizes:1.3 Other Types of Xtend1.4 Texture1.5 Is It Effective?2 Scivation Xtend vs Amino X: Is Amino X Better?2.1 Flavors available:2.2 Not all flavors are available in all size options. Sizes available:3 Comparison: Scivation Xtend vs Amino X3.1 Either … Continue reading Scivation Xtend vs Amino X: Which Is The Best BCAA Option?